A lightened, musicalized version of the dramatic Pushkin poem and Tchaikovsky opera based on it. Eugene Onegin (Mark Linehan), a rich dandy, comes to visit his friend Vladimir (Michael Jennings Mahoney) who has become engaged to Olga (Josephine Moshiri Elwood). Onegin encounters Tatyana (Sarah Pothier), Olga’s sister, and a mutual attraction develops. Later, Tatyana writes Onegin of her love for him, but he rejects her and goes off. Some time later, Vladimir invites Onegin to a party and Onegin takes the opportunity to engage romantically with Olga, infuriating Vladimir who then challenges Onegin to a duel. 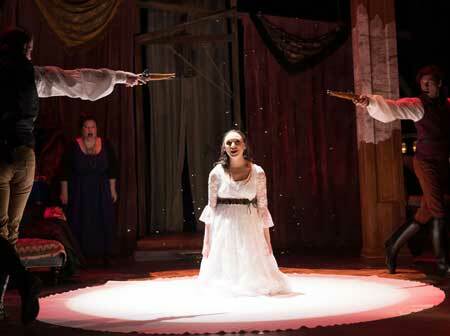 Onegin kills Vladimir at the duel and disappears. Some years later, Onegin finds himself at an event at which a beautiful woman catches his eye. It turns out to be Tatyana, who is now married to an much older man. Onegin seeks to pull her away with him but, despite declaring her continuing love for Onegin, she rebuffs him and remains faithful to her husband. This tragic tale told in a novel written in verse is not only compelling on its own terms but eerily prescient of Pushkin’s own fate. Faced with a brother-in-law who tried to seduce Pushkin’s wife, Pushkin engaged in a duel in which he was mortally wounded at the age of thirty-seven. This sweet, jazzed-up and musicalized version of the novel and the opera by Tchaikovsky on which it is based, adds some contemporary pizzazz to the goings-on, making a bit lighter and trendier. Despite its tragic theme, it is, all in all, kind of fun because of that. There is, for added spontaneity and Russified atmosphere, a vodka tasting in the lobby and vodka cocktails available at the concession stand. It makes for a fine time all around. The music and the lyrics are generally of the current standard musical theatre type, with fairly straightforward lyrics perched atop mostly straightforward, but occasionally slightly bent, atonal, harmonies. Those atonalities did not seem very musically advantageous in the otherwise quite direct composition, and sometimes unnecessarily tried vocal consistencies, at least in this production. This is really much more like a light rock opera than a musical, since it is all sung; there is no spoken dialogue whatsoever. Some of the singing is very good. Sarah Pothier, who plays an engaging Tatyana, has a lovely voice and uses it convincingly throughout. Veteran Boston musical theater actress Kerry A. Dowling has a wonderfully rich contalto which she plies to considerable effect in the minor supporting role of Mme. Larin. As Triquet, another minor supporting role, experienced musical actor Christopher Chew provides a very funny and entertaining interlude, primarily persuasive because of his comedic acting. In 2015, the American Repertory Theater premiered its rock-musical extravaganza Natasha, Pierre & The Great Comet of 1812, based on Tolstoy’s War and Peace. That innovation (which went to Broadway a couple of years later) seems to have set the tone in certain ways for this one. Onegin is a more tragic story in certain ways, and this musical version a bit more intimate and less pyrotechnic in its conception. But it seems born of the same general impulse, to deliver intense and evocative Russian literature in a more accessible and digestible form. Ilyse Robbins’ choreography, by the way, is outstanding, evident in its creativity at every turn, and contributes significantly to the overall effect of the show. Onegin creators Amiel Gladstone and Veda Hille worked on a show named Do You Want What I Have Got: A Craigslist Cantata in 2013, a hilarious title that makes me want to check it out. Apparently, Onegin was a huge hit in Canada where it was premiered a few years ago.